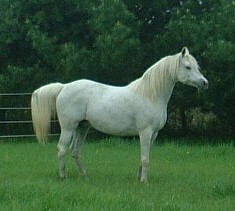 In 1993 or 4 Chantal Gauthier saw Charlie at a Quebec horse show and decided to breed her lovely grey mare, Follie, to him. In exchange, Mary was to receive the next foal, then send Follie back to St-Foy in foal once again. Follie came by her nick name when Chantal went to an auction not planning to purchase anything, but fell right in love with Follie's big liquid eyes and just had to "rescue" her. She called her her 'Folly", but with the French accent is pronounced slightly different. Follie had a great fear of men, especially in baseball caps and they spent many months overcoming some of her fears. Follie was an excellent school horse for Chantal for her intermediate riders. 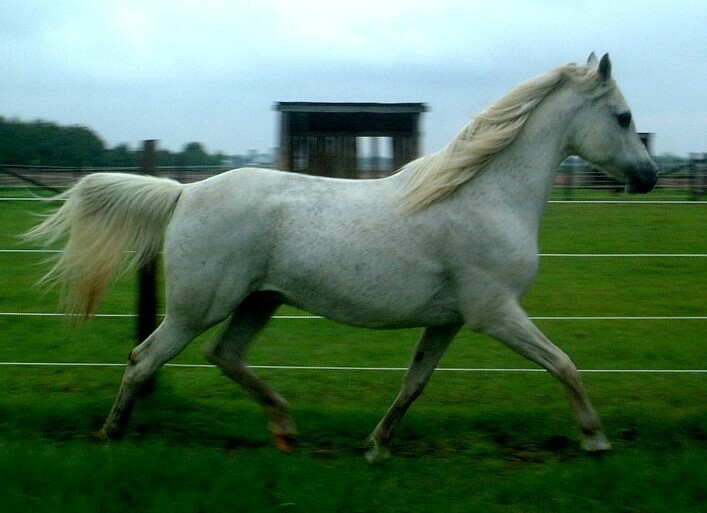 Follie first produced a lovely grey gelding for Chantal, then a stunning grey colt, Ibn Ibn Bee, for Mary. The next foal by Charlie was an even more incredible filly, Jalousie de Toscanne - yet another grey! Ibn Ibn Bee has been the only one shown so far and he was named Most Classic several times as well as Eastern Canadian Breeder's Champion Top 6 as both a 2 and 3 year old. Due to financial issues plus having her lovely daughter, Chantal offered Follie back to Mary as a brood mare. Mary jumped at this generous offer and Follie came to Maple Lane for good in 2001. In 2003 she gave Mary a handsome BLACK colt, Bee's Black Magic, which Chantal has purchased. Mary leased Follie to Dessia for a 2004 foal by Hennessy, a look alike black/grey filly of her dam. Follie is confirmed in foal to Al Hanifa Andohmi for a 2005 filly (fingers crossed).